The application window is currently closed. A new application window will open Monday, April 22, 2019. Please complete this survey to receive an email reminder when the application window officially opens. Detroit Public Schools Community District offers enrollment in five selective admission high school programs, which offer rigorous college preparation, career preparation, competitive athletics programs and inspiring arts programs. Students are required to take an examination for admission consideration. 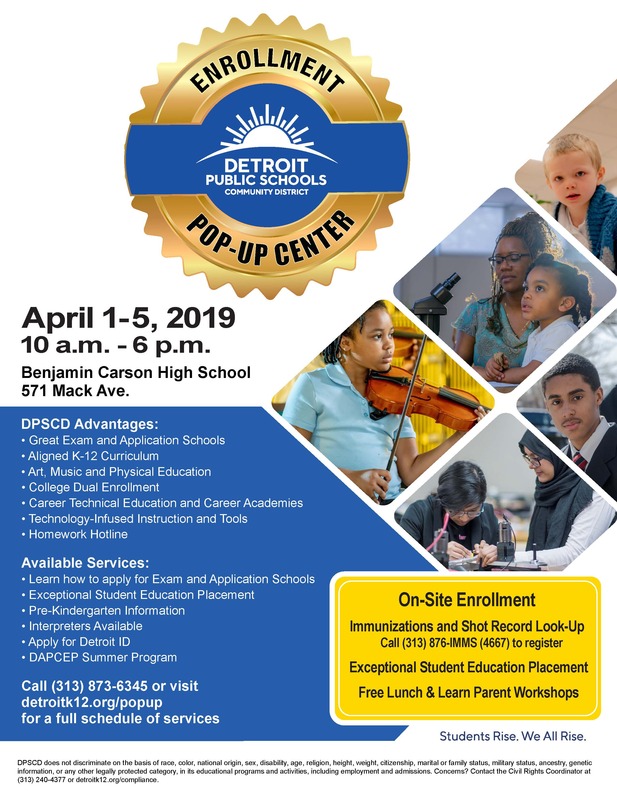 Students who applied in January and received a placement are invited to participate in Early Bird Enrollment at the Detroit Public Schools Community District Pop Up Enrollment Center during spring break, the week of April 1-5, 2019. The Pop Up will be held at Ben Carson High School, 571 Mack, from 10 a.m. to 6 p.m. daily. Please bring your required enrollment documents with you. The Detroit Health Department will be on site to do shot record lookups on Tuesday April 2 from 1-5 p.m. On Thursday, they will do immunizations from 1-5 p.m. and shot record lookups from 10 a.m. to 5 p.m. Translation services will be available Thursday April 4 from 1-5 p.m. Newly admitted students MUST accept their seat and enroll by May 15, 2019. You may accept your seat by simply clicking on the link in your placement notification. Students who did not get placed into their desired exam high school may petition for reconsideration. The petition window for students who applied in January opened on Friday March 15, 2019, and closes on Friday April 5, 2019. Petitioning students will be required to submit a petition form, along with an essay, two mandatory letters of support and either a third letter of support or an uploaded artifact. Please review the Petition Flyer or visit the Petition web page carefully for instructions. Who can apply to an Examination High School? Eighth grade students attending public and non-public schools are eligible to apply for the 9th grade class. Current high school students may also apply for openings in grades 9-11. The next application window will open on Monday April 22, 2019 and close at 11:59 p.m. on Friday June 28, 2019. The examination high school placement exam is a critical element of the application process. Every applicant must complete the placement exam for admissions consideration for one of the District's examination high schools. The next exam will be administered on Friday July 12, 2019. Applications for the 2019-20 school year will be conducted electronically ONLY. No paper applications will be accepted. Please review our Frequently Asked Questions. If you still have questions, please email them to exam.schools@detroitk12.org. To complete your application, you will need the following. Transcript or report card that clearly shows the student's cumulative grade point average. It must be from no earlier than the end of the 2017-18 school year. High school transfer students are required to submit a transcript.